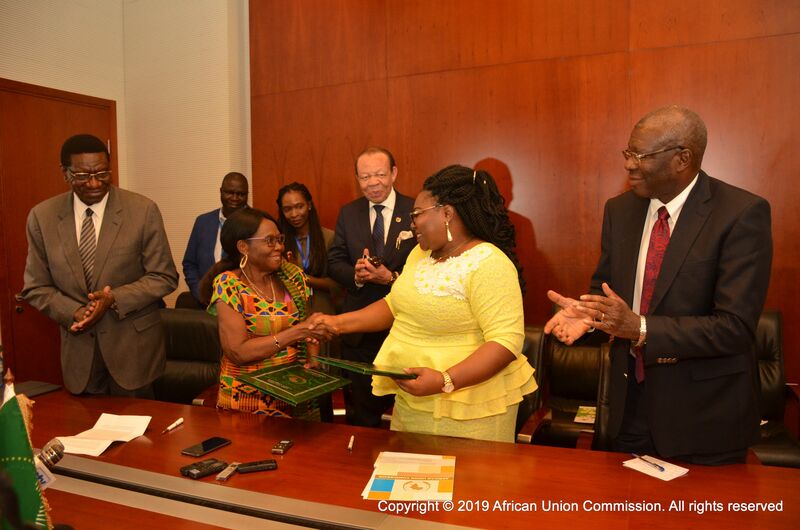 Addis Ababa, 18th January 2019: The African Union Commission (AUC) and the Coalition on Media and Education for Development Africa Forum (CAFOR) signed on 18 January 2019 a Memorandum of Understanding (MOU) to guide cooperation to enhance the integration of global SDGs and continental Agenda 2063 and its sectorial policy frameworks in education development, into country level policy and implementation. These frameworks include the Continental Education Strategy for Africa (CESA 16-25), the Science, Technology and Innovation Strategy for Africa (STISA 2024), and the Continental Strategy for Technical and Vocational Education and training (TVET Continental Strategy) into country-level developmental and sectoral strategies for Africa’s development. Speaking at the ceremony, the Commissioner for Human Resources, Science and Technology of the African Union Commission, Her Excellency Professor Sarah Anyang Agbor expressed her expectation that the implementation of the MOU would enhance dialogue on policy issues as recommended by the African Union through CESA 16-25, and the other AU policy agenda. She suggested that this would promote a shared understanding of educational reforms for youth participation in their respective national labor force, and help build commitment and ownership of the shared vision. The Commissioner committed to supporting CAFOR’s efforts to build capacity among the multiple actors and stakeholders concerned with communicating Africa’s educational programs. The Commissioner further stated that the Commission and CAFOR would share research, mapping of our institutions and organizations that offer life-long learning, towards ensuring that the youthful population would be well informed and develop better communications skills. She concluded by stressing that the Commission is counting on CAFOR and its extensive network of journalists, communicators and professionals in the fields of education, communication and African development to ensure knowledge and information sharing on the strategies for Africa’s development, consistent with the African Union’s agenda 2063. The Chairperson of CAFOR, Professor Kate Adoo Adeku, responding to H. E. The Commissioner, said that she looked forward to a very lasting working relationship with the African Union in the implementation of innovations to advance global and continental policies in discharging various responsibilities as stipulated in the MOU. The Chairperson of CAFOR noted that in implementing programs, the organization would be focusing on enhanced dialogue on policy issues that the AU has recommended through the Continental Education Strategy for Africa 2016-2025, and Agenda 2063, the African continent’s 50-year blueprint for transforming Africa’s socio-economic development. Prof. Kate Adoo Adeku told that audience that CAFOR would focus mainly on youths- male and female- ensuring that the challenges and solutions in our educational systems on the continent are better understood by those who are entrusted to implement them. Furthermore, she declared, that this partnership will go beyond sharing work and experience, and include sharing expertise. Noting that Africa has the most significant number of young people, and given that this preponderance can either become a crisis or an opportunity, he said education becomes a vital tool to advance Africa’s development efforts to create a prosperous, peaceful, integrated and happy and productive Africa. He stated that Education develops human capital. The Deputy Chairperson emphasized the gender dimension to education and added that education is essential for peace, which comes when people are better informed and educated. We need to have a literate and numerate Africa, an Africa that is imbibed in science and technology for development. He noted that at the time of slavery, it was punishable by death to have a slave educated, and, therefore, education is liberation, he stressed. Finally, he thanked Prof. Sarah Anyang Agbor, Prof. Kate Adoo –Adeku and Executive Director, Dr. Lawalley Cole and all CAFOR members for this initiative and assured all of the African Union’s full support for the realization of these ambitions. He also thanked the Ethiopian media for their continued engagement and their hospitality. The ceremony was moderated by Dr. Beatrice Njenga, Head of Education at the Commission with support from Mr. Olatoundji Francis Adaniao from the Office of the AU Legal Counsel. The occasion was graced by the attendance of Ambassadors accredited to the African Union and to Ethiopia, UN Representatives, members of CAFOR based in Ethiopia, CAFOR’s Executive Director, staff members of AUC departments and other prominent personalities from the AU Commission.